depression, heart palpitations, loss of libido, restless legs, and more. Everyone wants to know how to free themselves from the thyroid trap. As the thyroid has gotten more and more attention, though, these symptoms haven't gone away-people aren't healing. Labeling someone with "Hashimoto's," "hypothyroidism," or the like doesn't explain the myriad health issues that person may experience. That's because there's a pivotal truth that goes by unnoticed: A thyroid problem is not the ultimate reason for a person's illness. A problematic thyroid is yet one more symptom of something much larger than this one small gland in the neck. It's something much more pervasive in the body, something invasive, that's responsible for the laundry list of symptoms and conditions attributed to thyroid disease. In Medical Medium Thyroid Healing, Anthony William, the Medical Medium, reveals an entirely new take on the epidemic of thyroid illness. 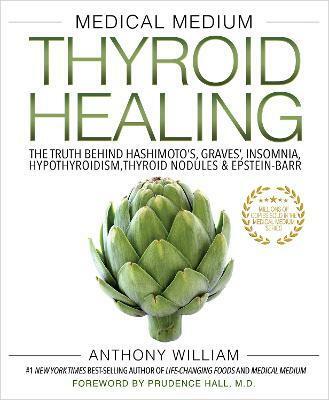 Empowering readers to become their own thyroid experts, he explains in detail what the source problem really is, including what's going on with inflammation, autoimmune disease, and dozens more symptoms and conditions, then offers a life-changing toolkit to rescue the thyroid and bring readers back to health and vitality. It's an approach unlike any other, and as his millions of fans and followers will tell you, it's the approach that gets results.